Indeed, Indeed…title says it all. Well most of it…no wait, I take that back. The title speaks of legendary winds, lots of crashing waves and cold waters, but also the tail of a kite. The tail of a kite, so long and held below. Gives birth to the forward flight, of the soaring skies. If not for the kite, they would never know. Wind becomes chilly, when whistling in one’s ears. Even more confused? Well, don’t worry…you will be guided through it all. This is the tale of a kite’s maiden flight and the man who flew it. For my boyfriend’s birthday, I hand made a book of ‘coupons’ for things we could do together. One passage mentions flying a kite, but at the time there was no kite to give him. This past weekend, he got the rest of his present; Mother had bought this amazing, colorful kite. We spent a good hour in those crazy winds; boys chasing the waves, throwing whole trees back into the water. All the while, I flew that kite and kept it at a steady, but secure height. It was only once my boyfriend got his hands on it that we A) started walking along the beach, and B) let the kite fly as high as it would go. We even found a man made, beach wood hut of sorts that had all the local beach wood scraps lumped together against a rock and a small opening to get in. Inside, the wind was more quiet and you could still smell the burnt wood someone had lit for a fire. Unfortunately I did not think to take pictures at this moment. Just the relief to have no wind rushing against my ears made me content. Eventually, I crawled back out and we started walking away to the other side of the beach where a cliff face was at the edge of the water ( you sort of see it in the picture). We got so close that eventually the howling wind was blocked and the kite finally fell to the ground. It landed by the cliff face, up around rough rocks and had to be retrieved by my brother. Once we turned back, my ears were pounding from all the wind rushing in. Luckily my newest scarf wrapped around my head and I had an Arabic look about me. The walk back always feels so much longer. We passed over the dunes back to the car, where the wind was much quieter and enjoyed some chips and salsa. For the good 30 minutes we sat, Boyfriend was slowing rolling the entire length of the kite string back up, the kite still blowing in the wind. 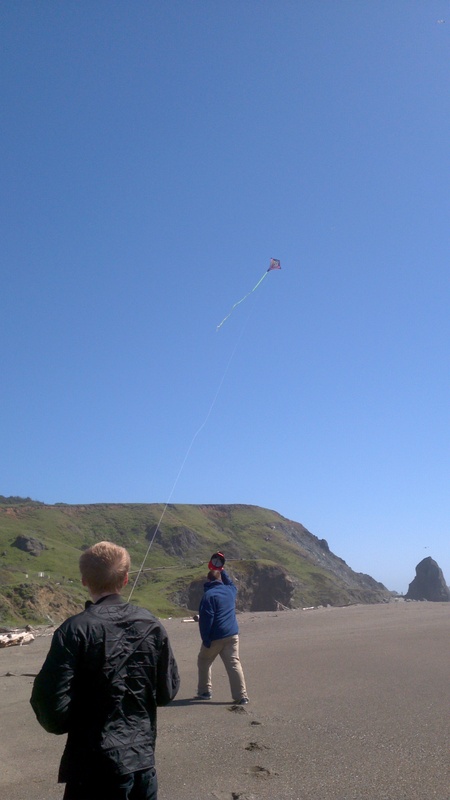 With less than 20 feet of line left, Boyfriend’s hand slipped and he let go of the kite. It took off a short distance up the dune before falling behind it and losing air. Thankfully his kite was retrieved. It wasn’t until we were all safely back in the vehicle and half way up the road that Rupert got a chance to see the ocean. But what was even more surprising for him, was to learn that this maiden voyage was not only for the kite. Boyfriend had his first kite flying experience ever, as well. ← Pasta With Rupert…OR NOT!